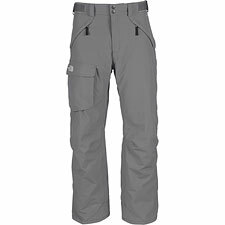 I wouldn't call North Face's ski and snowboard-oriented Freedom pant perfect, but it does get a lot right, making it quite appealing for this price point. You'll have no trouble finding things to like about the Freedom pant, starting with its very economical price tag, and continuing with its vibrant color choices, relaxed fit options, and handsome styling. The relationship begins to sour a tad, however, when it comes to some of the functional choices The North Face has made. Chief offenders include front zippers that are awkwardly placed, and an always-open vented gaiter within the boot cuff. What's wrong with the zips? They seem to be positioned in the least-easy to operate angle. Whether you're fishing out your lip balm or just trying to close a pocket, the zips require two-handed operation (particularly when they're brand new) thanks to that strange angle and a backward-oriented flap. Why would The North Face place the zippers in such an unusual orientation? Well, they do look good that way. I admit I am willing to make small or even large sacrifices in the name of fashion (my adoring fans deserve no less), so I'll forgive the zippers. However, there is also the matter of the 'Chimney Vented' cuff to contend with. The North Face markets the vent as a performance innovation: with the Freedom pant, the inner cuff/gaiter, which ordinarily seals your boot cuff against snow and wind, has a mesh upper. This system provides considerable ventilation around your lower legs, particularly if you open up the side zips. But do I really want an air-conditioned shell for Alpine skiing? Typically when I'm riding chairlifts I'm either basking in a sweatshirt, or else I've got my fingers curled up in my gloves and my toes wiggling in my boots to stay warm. A natural breeze about my calves is about the last thing I figure I need. That's my opinion, at least. Maybe there are large numbers of hot-legged skiers out there? Okay, as I continue to wear and use the Freedom Pant, I am finding myself less bothered by the venting, except when I'm riding a chair on cold and windy days—air will come up from underneath and cool your legs. As for the pocket zips, they seem to be easing up a tad; I'm able to open them now with one hand.